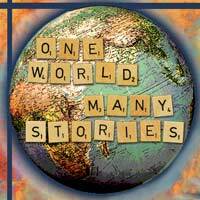 I-Fest 2016: One World, Many Stories highlights the importance of storytelling and self-expression in the formation of culture and identity. Explore your identity and share your story! Join us from 5-9 p.m. for workshops, performances, international foods, photo booths, and international education in the Grant Gymnasium on Friday, April 15. This event is free and open to the public. I-Fest will feature performances from renowned storyteller Oba William King, spoken word poet Kealoha, filmmaker Eliaichi Kimaro, and headline artist Kane Smego, an international SLAM poet. Both Kane and Kealoha will also be leading workshops at 2 p.m. that day for students prior to the event. These students will also have the opportunity to perform on stage with Kane and Kealoha during the I-Festivities. Click here to register for the Poetry Workshop. Volunteers needed to help with decorations, poetry workshops, food pickup, food education and much more! Click here to volunteer. This event is brought to you by the Multicultural Center and International Student Affairs and the Student Activity Fee.